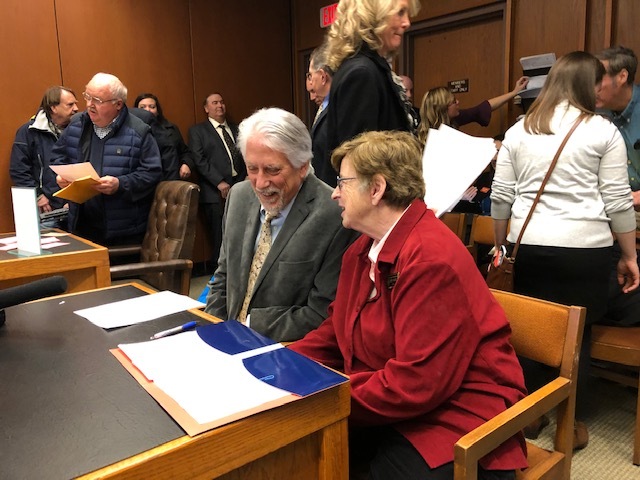 Balsams developer Les Otten is pictured with state Rep. Edith Tucker at a hearing before the House Municipal and County Government Committee on Tuesday. CONCORD – Advocates for the $170 million redevelopment of the Balsams Resort in Dixville Notch asked the legislature for a new law Tuesday that could be key to moving the project forward. Balsams developer Les Otten said there are reasons to be optimistic that House Bill 540-L could be the key to getting the project up and running. Otten and a number of North Country people spoke in favor of the bill at a legislative hearing on Tuesday in the Legislative Office Building. A few spoke against it. “I want to put people back to work,” Otten said. 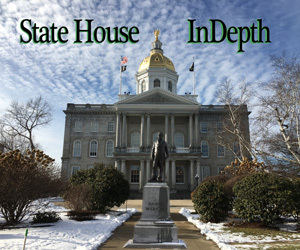 House Bill 540-L would allow the three-member Coos County Commission to issue bonds for the project, with the approval of a majority of its 10 members of the county legislative delegation. The improvements for new and renovated buildings would be in a Tax Assessment District already created for Dixville Notch under a 2015 law that was aimed at enabling the project to move forward with state guarantees. This measure differs from that plan by eliminating the participation of the state’s Business Finance Authority and taking away the state’s risks if the bond is not repaid. If approved, the risk for such a bond would be borne entirely by investors, if such investors can be found. Coos County would not be on the hook, either. “Under no circumstances shall the county or the unincorporated place, as issuer of a bond under this section, have any obligation of any kind to repay any of the principal or interest of the bond,” the proposed law states. Otten, a veteran ski resort developer, said he came to believe that a way around the problem was to remove BFA entirely from oversight and to leave it as other municipalities do, with their elected bodies. Otten, who developed Sunday River ski area in Newry, Maine, into one of the largest resorts in the East, and who was also a minority owner of the Boston Red Sox during restoration efforts of Fenway Park, said he is not giving up his plan to redevelop the Balsams even though it has been five years of work without a shovel pitched in the massive project. He said he has never seen a piece of land that has so much potential for development into a world-class resort. Otten added the bond would be unrated and the bond buyer would be in the first position to be repaid if there were financial problems. Without much marketing efforts other than writing to previous hotel patrons, 120 families have put down refundable, non-binding deposits for fractional ownership of the condo/hotel and its amenities. This would mean more than $22 million toward the $170 million, if the project goes forward. Another $20 million in investor funding is expected and the rest would come from loans and the bond. In its first phase alone, the project would mean more than 600 construction jobs and 400 hotel positions, according to testimony. It could be operational by the ski season of 2020-21, Otten said. Richard J. Samson of Stewartstown, a county commissioner who had initially supported the measure, said he now feels it would be too “risky” for the county. He also wondered why the BFA could not come to terms with the lender. He said the bill represented an “opportunity” to help the region’s economy and the county would not be on the hook for repayment. Berlin Mayor Paul Grenier also supported the measure. The historic hotel, located in an unincorporated area of Coos County, was shuttered in 2011 after more than a century of catering to the wealthy and well-heeled outdoor enthusiasts. Developers have envisioned a rebirth, transforming Dixville Notch into a world-class resort that would include the largest ski resort in the Eastern United States, more than quadrupling in size its now-defunct Wilderness Ski Area. Construction would include a gondola from the resort center over Route 26 to trails on the back side of the ski area, into a large natural bowl area. There would be 1,200 skiable acres and 22 lifts at full build-out. The first phase would make the ski area about the size of the one in Stowe, Vt. Developers, who acquired the entire property for $2.3 million in December 2011, have had difficulty creating a financing package for the first phase, priced at about $170 million. This bill, sponsored by State Rep. Edith Tucker, D-Randolph, would essentially modify the enabling legislation passed in 2015 to take the state’s Business Finance Authority out of the process for securing a loan guarantee. It would retain the boundaries for the Tax Assessment District in Dixville Notch. But Jamie Sayen, a resident of Stratford, said he learned that trying to lure Wall Street to solve economic problems is not enough. Nurturing local talent to create its own future is the way to go. He said he has seen no evidence that the project is realistic. “This is a troubled project,” he said. “There are vital questions of due diligence before you vote,” he told the legislators. Ray Gorman, a Colebrook selectman, said he worked for 32 years at the hotel and now works three jobs just to cover what he made at the Balsams. He said much of Golf Links Road, the winding road up to the hotel’s golf course and golf course itself are in Colebrook and could be developed for two-acre housing along the road. And he said there is not a lot of time left with the buildings aging. Bob Baker of Columbia said the bill really creates the opportunity for the county or any county with unincorporated places to issue bonds for anything, if the county approves it. Tom Tillotson, whose father operated The Balsams for more than 50 years, spoke in favor of the measure. He said he represents many residents of the county who support the bill. He said the problem at the hotel was always scale. The resort needed to be bigger in the winter to be successful. “My dad had the right idea to tack on a ski area to support the successful summer operation. The problem was he didn’t go big enough,” Tillotson said. What this bill does is give the county delegation and basically the local community an opportunity to solve their own problem, he said. In addition to the ski area, the plan would include redevelopment of the historic Dix and Hampshire houses, renovation of an 18-hole golf course designed by the famed Donald Ross, reopening close to 100 kilometers of cross country ski trails which could be used in other seasons for mountain biking, create a 500-seat conference center, a series of Nordic baths or hot springs, build a performing arts center and open air market.